Sosaku kokeshi is completely free regarding the colors, the patterns or the design. The artist make the kokeshi freely upon his imagination ! Abstract representation of plum blossoms. The kokeshi of this famous craftsman are artistics and minimalists. Kiyohaya Takao is considered the pioneer of the creative kokeshi. His dolls are similar to Togatta and Yamagata styles. Hanko seal by the artisan. Red and black lines with carved flowers. unusual shape and very good condition! The body delicately painted in red is decorated with bamboo stems and leaves. Small red knots also adorn the hair of this little Japanese girl. Unpainted, just turned and beautifully carved with cubist style. Sharp and straight contours; Cubism is an early twentieth-century artistic movement that is a revolution in painting and sculpture. It is characterized by the abandonment of the classical perspective, the bursting of the forms in different facets and the independence of the various plans. The artist seeks to represent an object in 3 dimensions, observed from all points of view at a time. As John Golding, an art historian and specialist of the movement, puts it, "Cubism is an absolutely original pictorial language, a totally new way of approaching the world, and a conceptualized aesthetic theory. print a new direction to all modern painting "
This one contributed in the 50s-60s to the creative (Sosaku) kokeshi movement. He made kokeshi with a very modern style with cubist design. His kokeshi are highly sought by collectors! This master is one of the most important influences on modern kokeshi design, and he won many awards. Little kokeshi mom with her cute child! No colors for these kokeshi creative style sober and simple style. Two different woods were used to make them. They represent the dancer of Izu no odoriko in the writer novel Yasunari Kawabata. Very massive kokeshi! 31 cm high (12,2") and 7 cm(2,8") in circumference. The body itself is 21 cm(8,3"). She have a bobbed hair ; characteristic of Usaburo kokeshi and willow branches carved on the body. Kokeshi imposing that must absolutely have ! Note small slit on 2cm at the base of the body (back). Usaburo Okamoto (1917-2009) has won numerous awards, and is the founder of Usaburo Kokeshi. He started making kokeshi in 1950. Then he invented a new style with new manufacturing techniques. This creative kokeshi is 16 cm (6,3") and wear a japanese umbrella. The Japanese umbrella is used to protect against the rain (but also the sun) which is made using many traditional Japanese techniques. Even today, it is composed mainly of materials from nature, such as bamboo or Japanese paper, which makes it a warm product. Essential accessory of the elegant Japanese! This artisan won numerous awards. Since 2006 he is retired. To comme across some Hajime Miyashita's kokeshi is a real pleasure ! An unusual blond kokeshi ! beautiful ! This lady is 19,5 cm (7,7") in very good condition. This creative kokeshi is 16 cm (6,3") with a green kimono beautifully carved with black bobbed hair ! This creative kokeshi is 21 cm (8,3") with sublime colors ! The dark red peony flower is the most popular peony in Japan. Itis associated with honor and respect. It also symbolizes wealth and prosperity in these cultures. 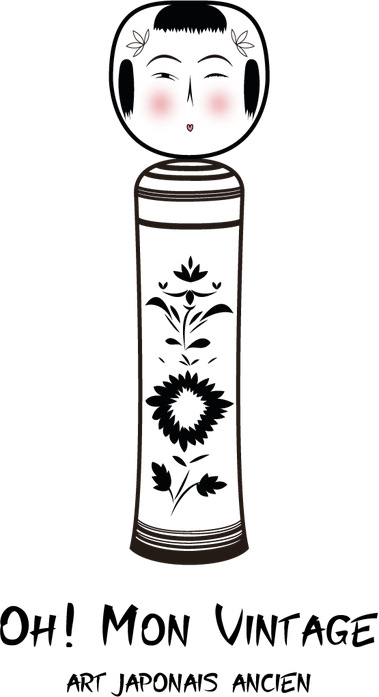 He has won numerous awards, including the highest price : "Prime Minister's Award"
Longilins, dark cherry wood, and beautifully carved flowers. Very good condition for both. They are hand made, but they are not identical. Today Usaburo has six artisans trained by Usaburo. A true work of art of Hiroshi Kato; artist who produced kokeshi in the 60's only! It is therefore rare to find kokeshi of this artist. This kokeshi is 23 cm (9") with a lovely jean haori !! Pretty haircut, haori material and the expression of her face really give her an elegant appearance ! This kokeshi is 25cm (9,8") really gracefull and with its roundness ! This renowned craftsman won many awards. Smiling and so cute ! Notice that she lost her little bow ! The Matagoro kokeshi dolls dates back several hundred years. These Matagoro kokeshi dolls are made from sugi wood (Japanese cedar) which is very soft. currently 9th generation of MATAGORO family ! The back is signed Matagoro.